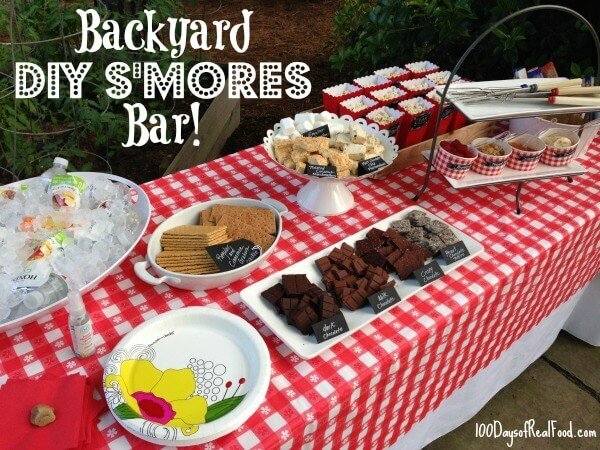 DIY S'mores Bar with Homemade Flavored Marshmallows and a Backyard Movie! 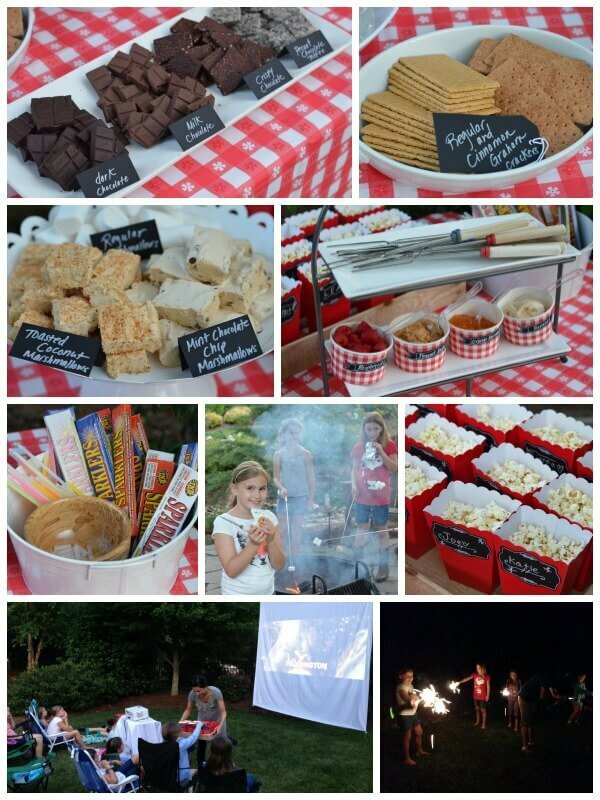 Home » Blog » DIY S’mores Bar with Homemade Flavored Marshmallows and a Backyard Movie! DIY S’mores Bar with Homemade Flavored Marshmallows and a Backyard Movie! I have a super fun summer party idea for you …Backyard Movie Night with a DIY S’mores Bar! We took the liberty of “testing” this out for you (haha) last weekend, and it was a huge hit. I let my girls each invite 5 friends to celebrate the end of the school year, and they assured me that the “fanciness” of our little buffet would not be lost on a bunch of 8 and 10-year-olds! But even so, my daughters and I enjoyed setting up for this last minute themed party that we attempted to make as “real food” friendly as possible. Read on for all the details. Okay, so s’mores are obviously gonna break our real food rules to some degree, but we can (thankfully) still indulge in this summer past time while somewhat honoring our values. Regular Graham Crackers: I personally like Annie’s brand because they are organic, contain some whole-wheat flour, and are void of artificial ingredients (unlike Honey Maid – so beware!). Cinnamon Graham Crackers: Also Annie’s brand – pretty much same deal as above. We also wanted to offer Chocolate Graham Crackers, but after checking 3 stores I could not find any without artificial flavors so we nixed that idea! I like to avoid artificial additives at all costs. Plain Store Bought Marshmallows: We offered these just for old times sake and also for picky eaters who weren’t interested in trying something new or different. I bought the “cleanest” marshmallows I can find at my store (which I realize are still completely junk food) by Elyon brand. Homemade Mint Chocolate Chip Marshmallows (recipe below): I used pure maple syrup for the sweetener in these and also Enjoy Life mini chocolate chips. I love our sponsor Enjoy Life’s chocolate because they are the only brand (that I know of) that simply uses the ingredients that should be in chocolate. That means their products are free of any funky additives (like soy lecithin often used by other brands) and therefore also free of the top 8 allergens that account for 90 percent of all reactions. Their products are also non-GMO verified. Homemade Toasted Coconut Marshmallows (recipe below): Also sweetened with maple syrup. Milk Chocolate: Not my personal favorite, but I know the kids love it. We bought our usual Green & Blacks brand, although you have to watch out because not all their bars have ingredients as clean as the 85% variety that we usually buy. Crispy Chocolate (with quinoa): This stuff is dangerous and not something I can regularly keep around the house or I will EAT IT ALL. The brand is Alter Eco and the crunchy quinoa in the bar reminds me of Nestle crunch bars! Oh and it’s equally amazing on a s’mores I learned. Toffee (dark chocolate and pecans): I was recently given this as a gift, the ingredient list was surprisingly decent (no weird additives or anything artificial), and the timing was perfect so it made it’s way to our tray of chocolate choices. Raspberries: This topping was clearly the winner – I had to refill it three times. This is one that I tried as well and can attest that the cold, juicy raspberries were pretty darn good on a s’more! Bananas: We decided to add bananas since they are good with chocolate, but to be honest it wasn’t nearly as popular as the raspberries. Peanut Butter: It was hard to tell if anyone even tried this one – there was still a lot left at the end of the night. Orange Marmalade: Since our movie pick of the night was Paddington we couldn’t leave out his favorite treat featured all throughout the film. The kids all loved this one. We also made popcorn that I didn’t serve until the movie started. Here are some more pics. The big attraction of the night (aside from the food, of course) was our backyard movie! I saw something similar in a magazine and thought it was such a cute and fun idea. The article said you could sometimes borrow projectors from libraries (not true in our case) or schools (also not true around here), but once I get my mind set on something there is very little to stop me so I kept searching till I found a way to pull this off! I came across a very cool movie “kit” you can rent online that includes everything you need – a projector with a built in DVD player, speaker, and cables (screens are available as well). The company is called ATS rentals and they overnight everything to you for the weekend! I told them what I was up to, and they sent my rental for free and said they want to give you guys a coupon code in case you want to try it too – so use “RealFood15″ for 15% off your rental. Oh and I should also mention we ended up using a big white sheet for our screen (pictured) because we came up with this party so last minute that they were sold out of the larger size screens already. Be sure to plan ahead if you can. 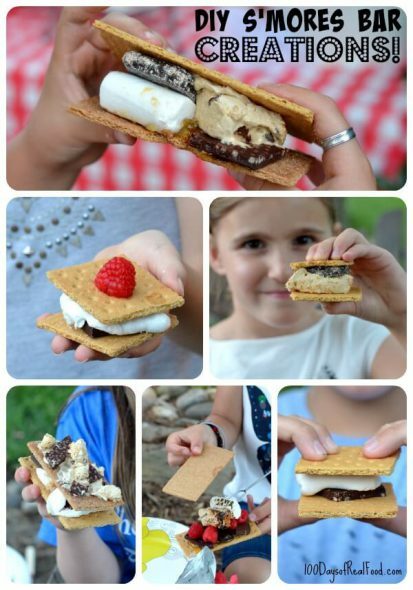 I got some good shots of the girls’ s’mores creations …it was fun to see what they chose and how much they enjoyed it! We loved being able to add the flavored marshmallows to the mix, but I must say in our experience they didn’t quite “roast” like the store bought marshmallows. They get warm and gooey and therefore work great in a s’more, but they don’t get quite as brown and toasty on the outside because there is no real layer there to help serve that purpose. So just be sure it doesn’t melt off your stick right into the fire is all! Watching the marshmallows come together from scratch (they do need at least 6 to 8 hours to set) is a super fun kitchen project though – something you have to try at least once so I hope you’ll have fun with the recipe below. Required tools: Electric mixer, candy thermometer, and time for the marshmallows to set! Prepare two square non-metallic baking dishes by greasing them with some butter. If using the coconut, carefully toast it for a few minutes (in an oven or toaster oven) until golden brown. Coconut can go from white to burnt very quickly so keep a close eye and stir often! Pour half of the coconut into a thin layer in the bottom of one of the baking dishes and set aside. Pour the cold water into the bowl of an electric mixer (or other large mixing bowl). Sprinkle in the 3 packs of gelatin and set aside. It will go to work on its own and start to harden while you work on the other part of the recipe. 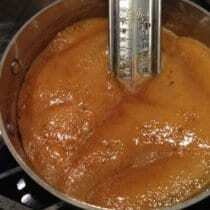 As soon as the syrup reaches the desired temp turn the mixer onto low and slowly pour the hot syrup into the gelatin mixture. I used a stainless steel 1/2 cup measuring cup to carefully add the syrup little-by-little without burning myself or making a huge mess. At first it will still resemble the brown bubbly syrup, but keep watching because it will change like magic right before your eyes! Turn the mixer onto high and whip until it thickens and looks like "marshmallow fluff," about 10 to 15 minutes. Add the vanilla extract and mix again until just combined. Spread half of the marshmallow mixture into an even layer in the baking dish with the toasted coconut on the bottom. Sprinkle the other half of the toasted coconut on top of the marshmallows. Go back to the other half of the marshmallow fluff still in the mixer and briefly mix in the chocolate chips and peppermint extract until just combined. Spread it into one even layer in the other baking dish. Allow both batches of marshmallows to set for at least 6 to 8 hours or overnight if you have the time. Then carefully peel out of the pan, cut into squares, and serve (or store at room temperature). My friend Carrie with Deliciously Organic recommends letting the individual squares dry out a bit before roasting them over the fire. Instead of butter, you can sub coconut oil to make this recipe dairy free. 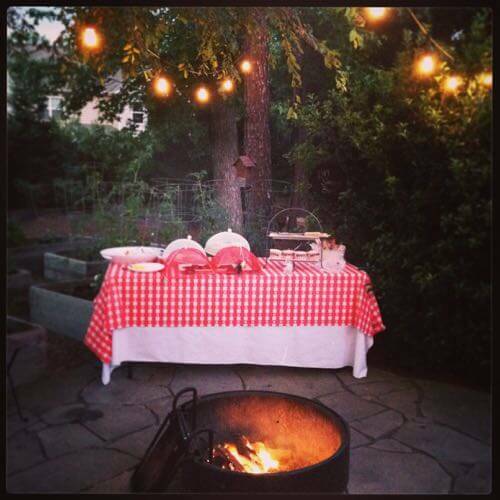 I hope you can use these ideas this summer for a fun night with family and friends. Enjoy! We love to make homemade marshmallows too! I just bought the ingredients for our summer fire pits but never really thought of a bar with various toppings. I love it and cannot wait to try it ourselves. Thanks for the great idea for the 4th of July. Love this idea of a DIY s’mores bar! Adding peanut butter to s’mores is one of my favorite ways to jazz them up! i’m surprised at the peanut butter…my all time favorite is dark chocolate with peanut butter and bananas. we call them monkey s’mores at our house. not really sure why except for the bananas, but the kids love them! No idea how easy they are to find outside of the Northwest but Theo bars are amaaaazing, only a few ingredients, organic and fair trade! I’m a milk chocolate eater and this is my obsession: https://www.theochocolate.com/product/7 – even being a non plain bar AND milk chocolate it’s only got 7 ingredients! Thanks for sharing your family fun with us!!! What a super cute idea! Love it…but I’m sure the kids all loved it more! What size baking dish are you using for the marshmallows? Hi there. S’more’s are a favorite campfire snack here in the US. They consist of freshly roasted marshmallows and chocolate sandwiched between graham crackers. 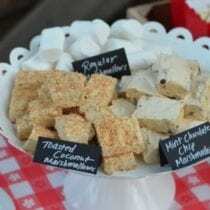 Lisa ‘s post features homemade marshmallows and some other variations. A Smore is a graham cracker topped with chocolate, a toasted marshmallow and then another graham cracker. A nice summer treat, especially if you already have a fire going outside! Do you want a S’more? How can I have some more if I haven’t had anything yet?? best dessert ever in my opinion lol. Love all your ideas, this looks like so much fun! I was wondering where you got the toasting forks from? I would love to have some like that. Hi there. You can find them at Target and other stores. I tried making marshmallows following Carrie’s (deliciously organic) recipe but they came out way too sticky.. So sticky that I couldn’t cut them! I ended up tossing them out. Any idea what I did wrong? I let them sit overnight before taking them out of the pan and attempting to cut them. We were planning my daughters birthday party – a swim party at Grandma’s house – when we first saw this post. It inspired us to transition her party into a Pool Party Movie Night, with s’mores instead of birthday cake and lots of rafts and inner tubes so the kids could watch the movie from the pool. We projected the movie directly onto the back wall of the house and it worked well. Thank you for being the inspiration for one of our favorite parties yet! For the Marshmallows, would you just leave out the flavors to get “regular” ones? Thanks! I live in a country with NO maple syrup, but I would love to make marshmallows. Any substitution suggestions? Hello. Lisa’s typical sub for maple as a sweetener would be honey but we’ve not tried that in this recipe. Has anyone tried using chilled coffee instead of water to make coffee, or mocha mallows? Or for that matter using juice to make fruit flavoured ones? How strong was the maple syrup flavor in the finished product? I’ve made marshmallows before with sugar and while we love maple syrup I’m not sure about the combo. Hi Amy. There is not a strong maple flavor but Lisa also added other ingredients to her homemade marshmallows. Do you think the marshmallow fluff could be used as a substitute to the awful jarred stuff when making different baked goods? Hi there. If you give it a try let us know how it goes! How long do these last stored on the counter? Hi. I’ve had the marshmallow in a sealed container on the counter for three days. we are having friends over tonight for a bonfire… was so excited to see your marshmallow recipe… made a batch last night and they are on the counter getting ready for tonight. they are sticky thinking to dust them with powdered sugar…I purchased Simple Truth organic powdered sugar. 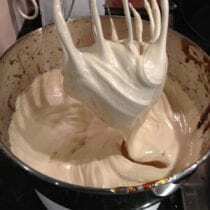 I see on a previous post using this recipe to substitute for jarred Marshmallow creme…I definitely plan to try it… maybe posting this to early and should wait until after the bonfire…but the fluff sure tasted good….either way! On the video posted on Facebook, you had cookie dough marshmallows. Can I get the recipe for those? Hi. Are you not talking about the one at the end of this post? can they be made with fruit pectin vs gelatin? My daughter is vegetarian and likes to avoid foods made with gelatin.